Here's a riddle: octa-core processor, great battery life, glass-metal body, IP68 water/dust resistance, released in 2017. Which Samsung smartphone comes to mind? We wouldn't blame you if your answer is either the Galaxy S8 or S8+, as both of these flagships possess such characteristics. However, these features can also be found on another series of Samsung phones introduced in the last 7 months and 21 days. Namely, we're talking about the company's A lineup and its three representatives for this year – the A3, A5, and A7. While the three handsets do differ in terms of screen size and hardware specs, they do share two big similarities as members of the 2017 A team – the trio boasts the same great design which is commendable, but what's also true is that all of them are still running on Android 6 Marshmallow at the time of writing. And that is completely and utterly absurd. Android 7.0 Nougat was officially released on August 22, 2016. That's a whopping 11 months ago. One might argue that the lack of Android 7 might be excusable if these were some low-end $150 handsets from 2016, but this is simply not the case here. All three of these devices were announced and subsequently hit the shelves this January, more than 3 months after Nougat was made available. These are representatives of Samsung's upper mid-range class and sit directly below its "S" and "Note" series, as constituted by their initial price tags that varied between €330 ($384) and €450 ($524) and, most importantly, their features and build quality. The 2017 A3 and A7 got a grade of 8/10 in our reviews, while the A5 was awarded a score of 8.5 - a testament to just how impressed our reviewers were when they got to try these mid-rangers out. Last but not least, the "A" in the Galaxy A series stands for the word "Alpha", which is another supposed big evidence of the lineup's standing in the Samsung smartphone hierarchy. Well, if that's the case, is it Alpha to cruise on a version of Android from 2015? To put the cherry on the cake, the older 2016 A series phones are actually on Android 7, which completely defies all logic. So, what's the reason for this absurdity? Well, probably no one outside of Samsung HQ really knows the answer to that question, so let's shamelessly speculate. The 2017 A5 and A7 models are one of the few Samsung handsets that use the Exynos 7880 processor (could very well be the only ones). There might be some sort of an issue with that specific SoC which caused the entire delay of the software upgrade. Meanwhile, the A3 sports an Exynos 7870 chipset, which can be found on the 2017 Nougat-powered J5 and J7, but there could very well be a backlash against the company if it decided to update the cheapest A version first. As such, all the A models are essentially in the same boat. If you want to completely dive into wild tin foil hat territory, consider this – the A lineup is not officially available in one of the biggest global markets – the USA. This could be due to the A5 and A7 providing a lot of the flagship pizzazz at a much lower price tag, so selling them stateside could undermine sales of the S series. However, the phones are available in Canada and Latin America and one can easily buy an unlocked GSM version on Amazon or any other big e-retailer, so Samsung might be delaying the update to make them less appealing to potential buyers. This speculation might be completely bonkers, but so is the entire situation. "B-But the 2017 A series will get an update any time now"
Yup, that's true, there are sightings of A3 and A7 models running Android 7 on Wi-Fi Alliance, which is a pretty certain indication that the update is coming to the 2017 A lineup in the following days or weeks. Samsung also confirmed that the software upgrade is going to happen, but does that really change the fact that people who bought these smartphones have to wait so long to get it? Meanwhile, the situation on the security update front isn't that much better. For example, the A3 received its very first Android security patch at the end of June and it had the fixes for the month of May. And finally, we mustn't forget that Android O is just around the corner, so what happens then? Will consumers have to wait till next year for that? The 2017 A3, A5, and A7 are undoubtedly well-made phones, but people who bought them also deserve to receive proper software support, at least for a certain amount of time. Otherwise, it's a ripoff. And iphone has the same old design for 4 years already. Yet we don't see you making an article about that. You mean bloatware that very few people use it. Yes, and security holes to fit a truck through too. Kind of impossible considering iOS 15 isn't a thing yet. But I guess you don't have to be accurate and truthful when your trolling. Bruh doesn't even capitalize his sentences. You really expect an intellectually satisfying viewpoint from him? so you're saying that keyboard with auto capitalize make it's user more intellegent? sounds legit.. The old design doesn't get you malware like the outdated Android does. Retarded logic from a butthurt Android fanboy. I thought you were being banned, part of apple fans with Android hates. 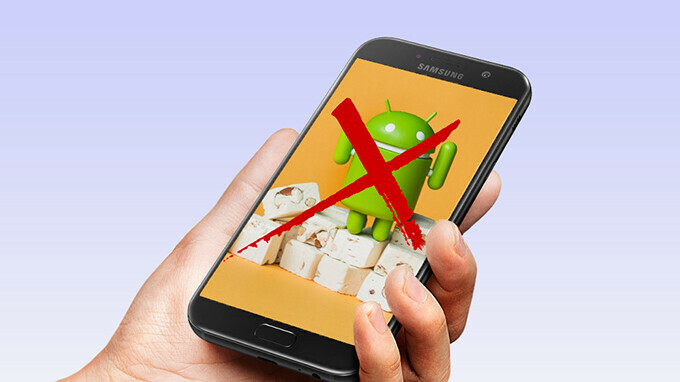 So then should Android fans with Apple hates be banned as well? If so, the mods would be very very busy and would ban 3/4 of the ppl that comment on here. No they should not. BEcause when the phone were in R&D stages, Android 6 is what was available, so that si what the phone is released with. No OEM stops R&D mid-stride just because a new firmware is available. But what shoudl happen is, if a new firmware does appear before a phone is complete, Samsung should be working on the update right way, so that it can be upgraded soon after its release. Samsung's product release cycle is the reason why samsung galaxy A series never comes with new android OS. It will be an insult to its flagship galaxy S series device if they release new OS and touchwiz to samsung A series earlier. Samsung should stop releasing A series mobiles before march. Let the new OS come up with S series, and then release A series in june or july followed by j series in august, september. It is excruciating for customers of galaxy A series to digest the fact that even galaxy J series comes with new OS. It seems like the few months of any major update on both platforms is a bug ridden mess. So is Samsung supposed to release a new device when the base code is a mess. I will take a little longer updates if it is not a buggy mess. Your montly security updates are far more important in my eyes and Samsung has been very good about that. Cars still have 4 wheels too. If an engineering design works, it works. Don't buy a Samsung unless its the Galaxy S line. Other than that, it's not worth your money. The Galaxy A line is worth my money. Not everyone likes the curved displays or super-tall phones. These phones are all trash. You can buy better chinese phones at lower price which provide better soft support than these $hits. Why does an article need to be written about this? Google's stock Android is behind on features, so Samsung's Marshmallow is still at the same level or even ahead in features. The main advantage of new Android versions is security and honestly who gets viruses on their Android phone? I've never had one. Also they'll get the Nougat update within a month or 2... People whine far too much about android updates. It's not about features or Samsung bloatware it's about bugs fixes and security improve. stfu, samsung release many mini updates to its phones, your argument is pure BS, just because it does not have the latest android, that doesn't mean that phones are not being updated. And for all of you apple apologits, take a look at this video, and stfu forever. https://www.youtube.com/watch?v=TTp7sc3oyJo Wake me, when you can do 1/8 of this on ANY ios version even 20 years from now. You've never gotten a "virus" on your phone so therefore nobody gets them? Really? Security updates are incredibly important to stay ahead of malware and device takeover exploits. An article needs to be written about this because, shock of all shocks, this is actually important, especially to people that own these devices. The only peopel who have ever gotten hacked on a phone, are people who jailbreak or root their phones or install apps from unknown or even some known sources. If you use your phone as intended, you will in fact NEVER Get hacked, get a virus or any malware. Yes fixes are important. But the only reason you all make such a big deal in this case is because its Samsung.